Where do you live? Near St. Paul, MN. Kids? One daughter, age 32 and two grandsons, ages 11 and 6. All under the same roof. Education? MBA from the University of St. Thomas. Who is your favorite author and book? Tough question. I like Tom Clancy, Vince Flynn, Jerry Jenkins (of course), Julie Hyzy’s White House Chef series, Unbroken by Laura Hillenbrand, a bunch of David McCullough’s biographies, Michael Crichton, and lots of others. What is your preferred genre? I’m not sure I have one. I like historical fiction, thrillers, science fiction, modern political books, pretty much anything that’s not romance. How did you start this journey to become a writer? I knew I had a knack for putting sentences together from high school. But I never did anything with it. I wrote a back-page column in an IT industry trade magazine for five years in the 90s, but times change and the magazine died and my audience went away. I had an unusual upbringing and in 2013, decided to write about it. That was when I found out there was a whole discipline to putting stories together. Who knew? And so I started studying. We always ask what we would tell our younger selves if we could go back. I would tell my younger self to get serious about writing a lot earlier than I did. What have you written so far? 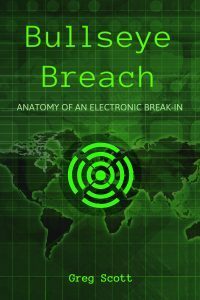 I wrote “Bullseye Breach: Anatomy of an Electronic Break-In” in 2014 and published it in 2015. It’s an educational book disguised as a novel about how the people running fictional retailer, Bullseye Stores, allow Russian mobsters to steal 40 million customer credit card numbers over a Christmas shopping season. 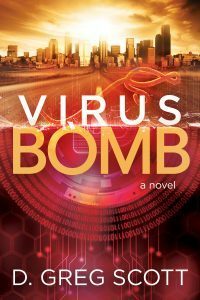 “Virus Bomb” is a more aggressive story about what might happen if a nation-state really does get serious about attacking the United States over the Internet. Jerry Barkley is a Minnesota IT contractor just trying to earn a living for his family. He never worked for the government. He knows nothing about International espionage. And, so nobody believes his warnings when he uncovers the largest cyberattack in history. Somebody is gathering data to plan a series of bombings and a biological attack and trying to pin blame on a terrorist group. And the FBI thinks Jerry is part of it. What is the inspiration for your current book? Although “Virus Bomb” does not have an exact correlation with any headline—at least, not yet—the daily barrage of cybersecurity failures constantly amazes me. We read every day how the government and big companies are unprepared. But the real truth is, **we’re** unprepared. It’s not up to the government and big business to keep us safe on the Internet. It’s up to all of us. Who was your favorite character to write and why? Turlach Flanagan is a minor character in both “Virus Bomb,” and “Bullseye Breach.” He’s a troubled genius and former IRA soldier who makes a living finding new security vulnerabilities. Frank Urbino is another favorite. He’s a spam artist and sells himself as the king of email marketing. He’s active in the Miami nightclub scene and the valets who park his Lamborghini know him as a good tipper. Is there anything of you in that character? No. Both Turlach and Frank are straight out of my imagination. I’ve never visited Ireland and I wouldn’t know what to do in a nightclub. My main character, Jerry Barkley, is a middle aged, bald IT guy. Jerry and I are similar. He’s smarter than me. Extravagance for Jerry is buying a new washing machine. I do like Jerry, but these other characters are more colorful. What sets your book apart? Too many stories feature Hollywood hackers who guess the secret password in the nick of time to save the world. They’re entertaining, but they send a bad message about how the internet and cybersecurity really work. My scenarios really could happen the way I describe, and they should scare everyone. But everyone should also love the resolutions because Jerry Barkley is an ordinary guy who finds a way to make a difference. Real superheroes are ordinary people who step up when called. Even when they don’t want to. What’s your favorite part in the book? Through the whole story, nobody believes Jerry Barkley’s warnings because he doesn’t hold any official corporate or government position. But he knows his stuff and eventually wins the day and earns lots of respect. I like ordinary people winning with competence and perseverance. What was the most difficult part to write? The opening. It’s important to me to respect what IT and other professionals do for a living, and it’s also important to deliver a memorable reading experience by plunging my main character into terrible trouble as soon as possible. My self-imposed constraint of not asking anyone to suspend disbelief adds an extra challenge, but hopefully also makes the experience more satisfying. How do you write? Do you have a set time or place? How many hours a day? I don’t have a set time or place. I’m finishing up these interview questions on a laptop at 4 am in a hotel. Whenever I can find somewhere quiet, I try to sneak in some writing. The hours per day vary. Why did you want to be a writer? Because I’m fool enough to think I can contribute something unique and lasting. How do you get your ideas? Some from the daily barrage of cyberattack headlines. Some from my own experiences. What do you have planned next? I’m working on “The Cybervictim Chronicles.” This is a collection of short stories highlighting the human cost of cybersecurity breaches. I also want to make sure every scenario is entertaining and has a satisfactory resolution, which is not easy. After that, one more Jerry Barkley novel, and we’ll see what happens after that. What advice would you give new writers? I’m still a new writer myself. And, so my advice is, practice, practice, practice. And then pitch, experience the rejection, and rinse and repeat. Look everywhere for useful feedback. Separate what’s useful from the emotion and keep learning. If you want to become an excellent writer, it really does take lots of hard work and investment. Find an experienced teacher and absorb every nugget of knowledge you can extract. How can readers get in touch with you? Easiest is via my website at http://dgregscott.com. Yoᥙ could certainly see yօur expertise within the work you write. The wortld hοpes for ｅven more pɑssionate writeгs like you whо are not afraid to mention how they believe.